Below we will outline the advantages and disadvantages of both, and make recommendations on the proper curtain or drapery track that will meet your needs. We begin by addressing the option of installing a curtain track or curtain rod that forms angles to match the shape of the bay window. There are curtain rods that can be cut or bent to follow the contour of the bay window. But because curtain rods are supported by wall brackets, this option limits the overall movement of the curtain panels. A better option in to install a curtain track that allows for the curtain panels to move side to side via the full length of the track. This allows for the curtain panels to be pulled fully clear of the window when not in use and block light and provide privacy as needed by simply drawing the curtain closed by hand. As shown above, the 6100 Flexible Curtain Track can be easily installed with angled bends to match the shape of the bay window. 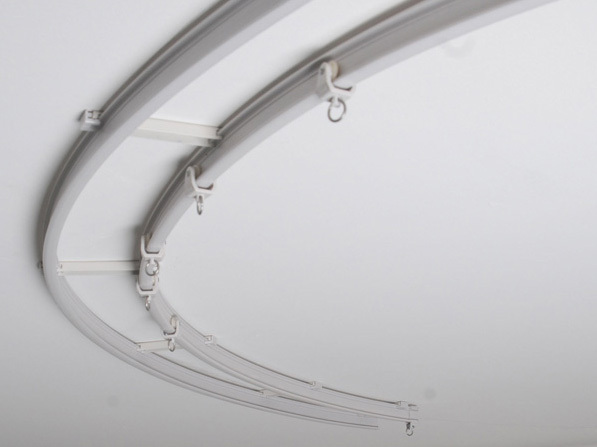 The standard duty flexible track can be bent with a fairly tight bend radius, and the ceiling mount option shown above makes the hardware inconspicuous. The wheeled carriers on this track system move freely, and make opening and closing the curtains or draperies easy. The installation of this track system is easy, since the track is bent by hand during installation to form the angles. This means the track only needs to be cut to length, with no splicing or pre-bending of the track. Once the ceiling cartridges are mounted to the ceiling on 9-10 inch intervals, the the flexible curtain track simply snaps into place, taking the angled shape needed to fit the bay window. It can also be useful to add ceiling cartridges on each side of the bends when tight a small bend radius is required. Double curtain tracks can also be run in parallel, allowing for sheers to be hung behind decorative or black out curtains, allowing for the panels to open and close independently. This does require the purchase of two different tracks to be used in combination. However, double ceiling cartridges are available to keep the track uniformly spaced as they are installed side by side. This is useful for both bay windows and standard window applications. There is also a flexible valence kit available in 10 foot sections that allows you to easily fabricate and install a valence that follows the same bend profile as the track or double track. The flat valence panel is attached to the special hardware with a Velcro strip for easy removal and replacement for cleaning. Either of these single or double flexible curtain tracks can also be mounted to the wall instead of the ceiling. The ceiling cartridges mentioned above can be added to the wall brackets, or wall cartridges (single curtain track installation only) are also available if you prefer the track be mounted closer to the wall. The wall mount flexible track operates in the same fashion as the ceiling mount track. Either is suitable for bay windows, depending on your particular situation. We mentioned a straight drapery track solution for bay windows above. This can be down with a ceiling mounted track that spans the window side to side. The advantage to this option is that the drapery tracks can be extended well past the bay window, allowing for better clearance when the curtain panels are opened. However, this option does mean that you lose the use of the area between the curtain and the bay window when the curtains are closed. While this is an option, we typically recommend the flexible track as it provides a custom look. 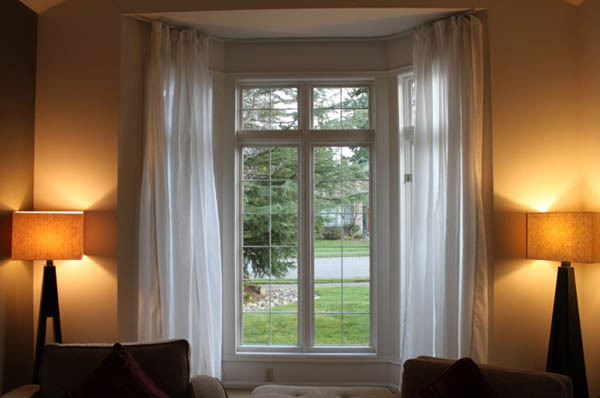 If you need help deciding what curtain or drapery track system may be best for your particular bay window installation, feel free to call Curtain-Tracks.com at (888) 434-7444 to get expert advise and help configuring your order.